email Reaching New Heights, LLC Public Relations. 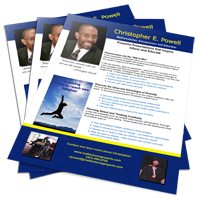 Download Christopher E. Powell’s media interview sheet with biography, sample topics and questions. How was life for you as a child growing up with Cerebral Palsy? How did you find the inner strength to deal with your condition? Who were your support team as a child? Why do you say diversity is one the greatest untapped assets for corporations? I’ve heard you say that our greatest challenges are our greatest gifts in disguise. What did you mean by this? You have had to overcome tremendous challenges in your life. What have learned from your experiences that you think business leaders, entrepreneurs and students today could benefit from? What is the most difficult aspect of dealing with your condition? What advice would you give those who are the targets of “bullying”? How can people find out more about you and Overcome Your Limits? 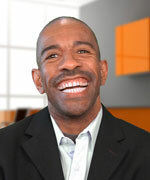 Christopher Powell is a mathematician, businessman, and motivational speaker. He is also living with cerebral palsy. Despite his condition, Christopher is living his dream. He is President of Reaching New Heights, LLC and Math Tutoring Experts, LLC. In addition, Chris serves as the Coordinator of the Mathematics Learning Center at Montgomery College, where he inspires students to reach beyond their limits. Chris is the perfect example of what being extraordinary is about — personal triumph, overcoming challenges, turning negatives into positives, and helping others. For many years Christopher was completely dependent upon others in every aspect of life, but having a disability hasn’t prevented him from achieving “the extraordinary.” Living with cerebral palsy has helped Christopher find multiple solutions to problems. Without the use of his hands, attending college was a major feat. After nine long years he received a bachelor’s degree in mathematics. The experience provided him with the confidence to forge ahead and to excel in other achievements including business.